According to recent news accounts, Defense Secretary Chuck Hagel has plans to reduce U.S. defense spending dramatically — even to what used to be considered peacetime levels. There are reasons to wish him success, and there are reasons to doubt he’ll be able to make much change. One of the drivers of defense spending is the extent of our commitments worldwide. Like many a great power before us. . . Check that: Like every great power before us, we are over-extending our military. Here’s a map that makes that clear. 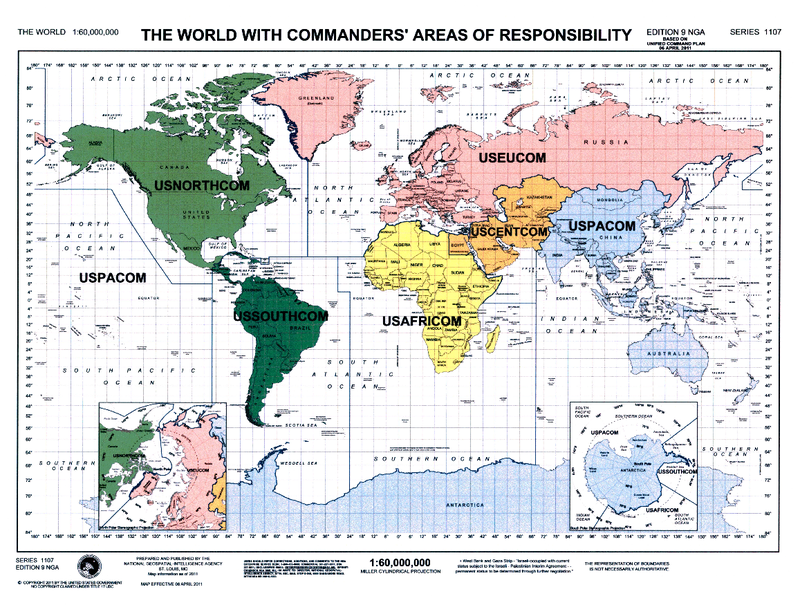 This is an official map from the Pentagon, showing that every inch of the Earth is the “responsibility” of one U.S. military commander or another. Here is the org chart for BU undergraduate admissions, which allocates responsibility for the entire world except the North and South Poles in greater detail than your Pentagon chart. The question of the the appropriate role of the US military overseas is a very good one, but using that Pentagon chart is silly. I’d say your comparison is inapt. The U.S. military commanders and the BU admissions team have both carved up the world but for very different purposes. Obviously their purposes are different. But my key question remains unanswered: which region of the world do you think needs no military person assigned to it and why? Why do we need troops in South America? Come on, professor–surely you know the difference between a geographic area appearing on a map of responsibility and troops actually being stationed there in significant numbers? It is again as if you confused the BU admissions office geographical responsibility chart with large numbers of BU personnel working overseas. Are there actually any troops in Anarctica? Some of the deployments may simply result from one of the laws of organizations–once a new military base, governmental committee or university department is created, it often outlives its usefulness for years or generations. You might remember the endless battles over reducing military bases in the US–especially those in the Red States which denounce every other form of federal spending. If you are wondering what the roughly 100 troops in Argentina, Brazil and Chile combined or the handfuls in most of Africa in 2012 did, some guesses include guarding our embassies, gathering intelligence, antiterrorist and drug smuggling activities, providing support for visiting US naval bases and assisting in sales of military equipment. You may recall that 2 US embassies were bombed in Africa even before the recent Benghazi tragedy or seen the movie Captain Philips featuring naval action off the coast of Africa. Perhaps you also thought the US should have assisted in preventing genocide in Rwanda and the Sudan, or taken a more active role in Libya or Egypt, without thinking that the US military having to learn about African nations on the fly, as happened in Somalia, is unwise. I am more sympathetic to your argument about Germany–but again suggest that events in Kosovo and Bosnia showed that troops can be needed in Europe. You also may not be aware that those troops include ,many supporting operations in Afghanistan, such as the prominent hospital at Ramstein. Whether, in the face of Putin having invaded the Ukraine and Georgia in recent years, reducing troops in Europe is a smart signal to send is also worth considering. The overarching question is how to stop aggressive wars or internal genocide overseas. One option is to do nothing and accept that Rwandas will continue and decide that China threatening Japan or Russia reassembling the Iron Curtain is not our problem, morally, commercially, etc. The UN is seldom effective, because of the veto powers by the major powers. Tempting as it is to tell Europe, Japan and South Korea to defend themselves, the Japanese Prime Minister honoring war criminals suggests there might be unintended consequences. And surely you are not suggesting that reliance on threats of nuclear war is a good idea. As with the blowhards on Fox saying Obama just needs to “bully Putin back”, reducing our troops overseas needs to be a fact-based process, rather than a slogan. Add to the list the NSA, CIA and the entire defense industrial complex. Also there are organizations that you have never heard of that would add to the list.